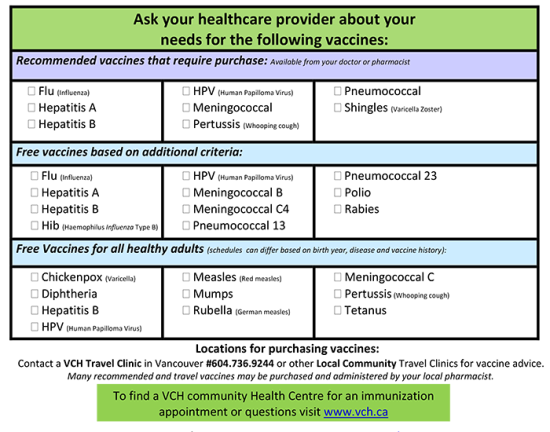 The National Advisory Committee on Immunizations (NACI) recommends many vaccines for adults, some of which are given free in BC. All adults in BC can get a booster of Tetanus and diphtheria (Td) vaccine every ten years. If you missed your basic series of vaccines in childhood, or depending on your health, age, and other risk factors you may also be able to get additional free vaccines to protect yourself against other harmful vaccine-preventable diseases. A limited number of other vaccines are also recommended for purchase.